The sign has "eyes" that belong to General Motors, part of an outdoor campaign using cameras on billboards to identify passing vehicles by their grilles. 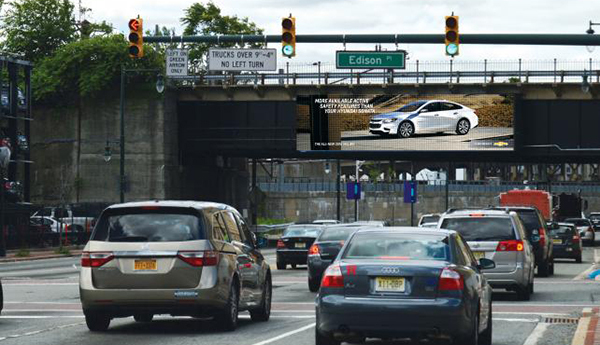 When Camrys, Altimas, Sonatas and Fusions go by, the system tells a digital billboard 1,000 feet down the road just what to tell drivers about why their cars are inferior to GM's Chevy Malibu. Some will learn, for example, that the Malibu has "more available safety features than your Hyundai Sonata." 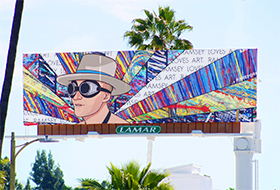 "Their branding is to 'Find New Roads' and they really challenged us to find new roads with out-of-home and push the envelope," said Helma Larkin, CEO of Dentsu Aegis-owned Posterscope USA, which created the effort in partnership with outdoor ad company Lamar Advertising as well as Carat and Commonwealth McCann. The campaign, also rolling out in Dallas and New Jersey, exemplifies just one way that technology is fueling a renaissance in out-of-home advertising. Marketers are linking online data to digital billboards, producing ads that bridge the digital and real worlds. And audience-measurement techniques relying on mobile devices are giving brands a better grasp on what types of people encounter their signs every day. As a result, out-of-home advertising is drawing a steady stream of marketing dollars even as other forms of traditional advertising lose ground to digital. It doesn't hurt that consumers are encountering more signs and out-of-home video while online ads and TV commercials get easier to avoid. Out-of-home advertising was the only traditional media business to grow last year, Magna Global said in its ad revenue forecast last December, citing "the superior yield brought in by digital panels as well as better measurement and trading metrics allowing OOH and cinema to tap into branding budgets and TV budgets." Marketers are increasingly attracted to outdoor partly to link it with their mobile marketing. Look no further than the streets of New York City, where brands are taking advantage of new digital signs appearing via the city's LinkNYC program. The program aims to eventually replace more than 7,500 pay phones with free Wi-Fi kiosks. 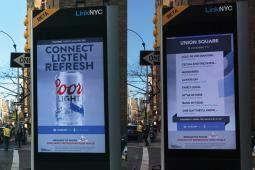 Coors Light is running ads on the kiosks that direct people to open Shazam for a list of the app's most-searched songs in that neighborhood. Mobile ads then direct people to the nearest store where they can buy Coors Light. The agency behind the campaign is IPG Media Lab. MillerCoors plans to increase its outdoor budget by 10% this year, said Brad Feinberg, the marketer's senior media and digital director. "We are finding greater opportunity to apply technology to out-of-home," he said. Competitor Anheuser-Busch InBev is also upping its outdoor game. In a retargeting play, the brewer has begun using geofencing techniques to serve mobile ads to consumers who recently drove by a billboard. "This kind of connected user experience, underpinned by data, has the potential to drive greater return on outdoor advertising and truly reshape the future of media," Tracy Stallard, the brewer's U.S. senior director of media, said in a statement. Technology is also being used to make outdoor creative more compelling, contextual and useful. 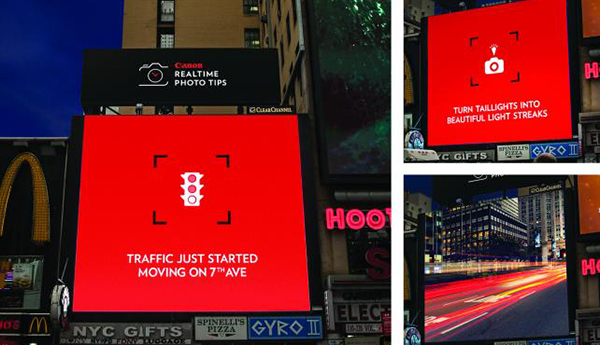 Canon and agency 360i recently fed digital billboards in New York City with real-time data including weather, traffic and time of day, accompanied by photo tips appropriate to the conditions. A billboard near the Brooklyn Bridge, for instance, counted down to sunset. The effort marked the first time Canon ran outdoor ads in several years, said Canon USA PR director Michelle Fernandez. Coca-Cola Co. began experimenting with dynamic outdoor advertising in 2010 when it created the Digital Network, a group of electronic billboards the company owns and operates via lease agreements. The network now includes roughly 30 billboards as well as screens on bus shelters and vending machines. Coke is able to push out messages tied to inputs such as weather or news. "Technology has allowed us to put a billboard in the right place at the right time in a way we've never been able to do before," said Ivan Pollard, senior VP-strategic marketing at Coca-Cola North America. But when Coke makes targeted plays in outdoor -- like publishing a consumer tweet about a brand -- it ensures that the "personal story is one that resonates with everybody," he said, because outdoor remains a one-to-many medium. But on that front, too, outdoor media providers are deploying sophisticated audience measurement techniques to help brands target their ads better. Clear Channel Outdoor Americas recently introduced a targeting program called Radar that it says uses aggregated and anonymous mobile data provided by vendors such as AT&T. With the data, it plans to eventually score its billboards against 1,800 audience segments, according to Clear Channel Outdoor CMO Dan Levi. So, for instance, it can tell which billboards are most likely to be passed by people who have been to a car dealership in the last 30 days. "What we've done is leverage the mobile data to be able to identify people who are in the market for a car—where do they go, how do they move throughout the day and what are the opportunities to most efficiently engage with them," Mr. Levi said. The outdoor industry is even dabbling in programmatic techniques normally associated with online advertising. In early March, Clear Channel Outdoor hired former ShareThis executive Wade Rifkin to the new post of senior VP-programmatic. He will be charged with piloting "the development of significant partnerships with data providers and ad technology companies to bring programmatic out-of-home offerings to buy-side advertising partners," according to a statement. Posterscope last year launched a real-time trading platform for digital billboards as part of a pilot program in partnership with Vistar Media. 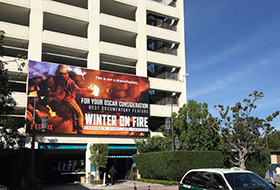 Out-of-home media owners including Lamar, Outfront Media and Clear Channel Outdoor have joined the effort, according to Posterscope. Ads can be bought seconds before they appear on the boards, Ms. Larkin said. The buys might be pricier, but they are more efficient, she said, because "the data we use tells us that spot is more valuable because the audience we want to target is there at certain times of day." Even as the outdoor industry adopts digital-like tactics, advocates are selling outdoor as carrying less baggage than digital, namely the ad fraud and ad blocking that afflict the online ecosystem. 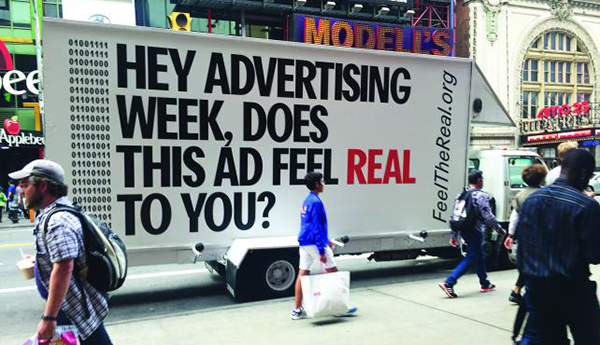 That point was at the center of a campaign run last year by the Outdoor Advertising Association of America and created by agency Partners NYC that used outdoor ads to direct ad execs to FeelTheReal.org. In a follow-up paper, the organization touted the results, which included 27,061 unique visits to the site in seven weeks, as proof that out-of-home drives digital engagement. The paper contrasted site visitors driven by outdoor ads to visitors sourced from online traffic brokers whose bot-driven traffic was "dead and sterile." David Krupp, North American CEO for WPP out-of-home agency Kinetic, praised the campaign, noting outdoor media is "very visible, there isn't any fraud, and it should be an integral part of a lot of campaigns that are out there where digital is taking so much of the budget share." While "that's not the pitch that I go in with," he said, "it's always nice to have that in your pocket." Still, an increasingly high-tech outdoor business can't remain immune from some of the issues facing digital, such as privacy concerns. Sen. Al Franken, D-Minn., in February sent a letter to Clear Channel Outdoor expressing concerns that its Radar program "may be collecting Americans' personal information, including sensitive location data, and sharing that information without people's knowledge or consent." Clear Channel Outdoor is "not collecting data," Mr. Levi said. "We are not tracking people. ... This is about indexes that are tied to audience segments." Similarly, Ms. Larkin stressed that GM's Malibu campaign is not used for data collection. The footage pulled from the cameras blurs out license plates and windshields, focusing only on car grilles, she added. And "within minutes, the video and the images related to the vehicle are deleted from the system." But Malibu surely hopes the ads are not so quickly erased from the minds of passing motorists. It is too hot in Los Angeles to be winter, but the days are too short for summer. Which season is it? Look to the billboards.